Why has the response to Michael Brown’s murder been to crack down on dissent and arrest journalists? What has evolved since the death of Michael Brown, however, illustrates the challenges that arise when law-enforcement officials fail to fully recognize and embrace their dual responsibility: to maintain public safety while at the same time guaranteeing the rights of Americans to speak, to practice journalism, to assemble for the purpose of making demands on those in power. Missouri Governor Jay Nixon, a former state attorney general, seems to recognize that something had gone badly awry. 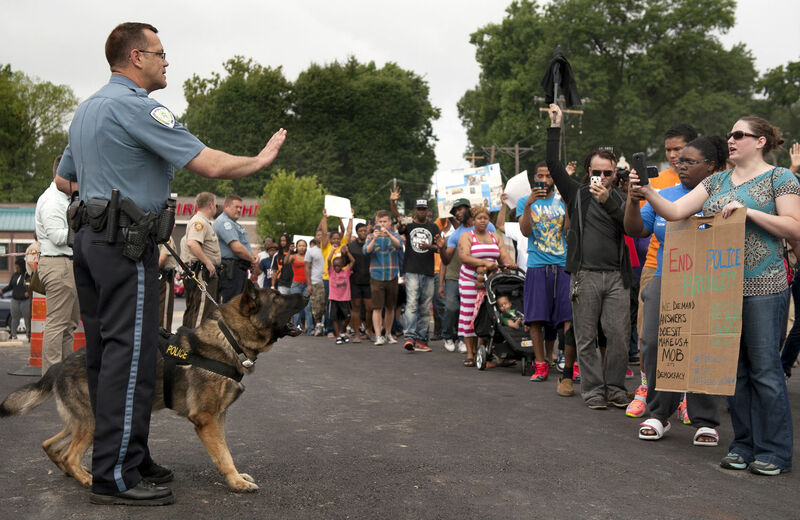 After another turbulent night in Ferguson, the governor finally canceled appearances in other parts of the state on Thursday and announced he was going to the community where heavily armed police have confronted, arrested and detained protesters and journalists. Law enforcement agencies have a duty to maintain public safety, to arrest and prosecute those who commit crimes, and to take reasonable steps to prevent violence, looting or riots that might threaten communities. But there is a parallel duty to protect against abridgments of First Amendment rights. The balance can be difficult to strike, but it is when the difficulty arises that the striking of the balance is most important. When the balance is not kept, there is, as Demos president Heather McGhee says, “an affront to democracy” that must be addressed by local, state and federal officials. Evidence of the constitutional crisis is also found in reports that journalists who are attempting to cover the story are being harassed, arrested and told to exit the scene. On Wednesday night, reporters for The Washington Post and the Huffington Post were detained by police in Ferguson, in what Washington Post executive editor Marty Baron described as a “wholly unwarranted…assault on the freedom of the press to cover the news.” Later, St. Louis Alderman Antonio French, who has used his Twitter account and interviews to report on developments in the St. Louis suburb, was jailed for most of the night. “In an American city, people are being tear-gassed and snipers are pointing rifles at them,” French told the St. Louis Post Dispatch after his release Thursday morning. “Everybody should be upset.… [the] heavy-handed police approach is actually making the situation worse. In particular, French objected in media interviews to police crackdowns on peaceful protests during the evening. That is a basic premise of the American experiment. It is, as well, a basic premise of effective policing. The police can strike the proper balance. And the people will respect them when they do so. This week, Mahoney was up for re-election. The sheriff beat his challenger, winning 89 percent of the vote.